Making screencasts on the iPhone/iPad is mostly done with external apps that are known to give more features. But for those of us who do not prefer third-party apps and are running on at least iOS 11 or 12, there is a built-in screen recorder though not activated by default. This means the feature has to be enabled first in the settings before getting started. 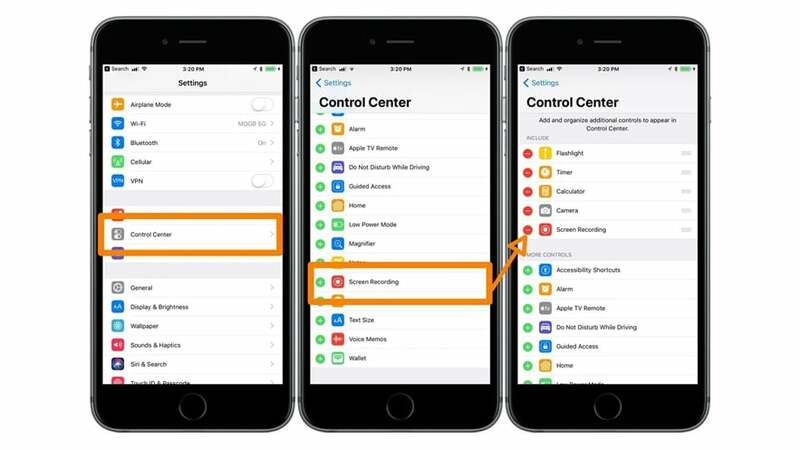 For iOS devices running is iOS 10 and below, you have to use third-party apps in order to achieve screen recording capabilities. With this tool, you will be able to screencast without having to use other apps that are most likely to compromise on the device’s performance. Activating the native iOS screen capturing feature is not time-consuming at all if at all you know how to go about it coupled by the fact that it does not require any extra app installations. Open Settings>Control Center>Customize Controls and from the More Controls category add screen recorder to include section. After this, a screen recording button will be available when you swipe up from the bottom of the home screen. Just click on it when you need to start a screen recording task. On the iPhone X or later or iOS 12 and later devices, it is much simpler in that you only need to swipe down from the upper-right corner of the screen. This is the main task that the built-in screen recorder for the iPhone/iPad will let you achieve. However, the greatest shortcoming here is the limitation in the recording setting. You will not be able to tinker with resolution, fps or even the bitrate. Whether it is gameplay, a review, a walkthrough, a guide, tutorial or any content of choice, this tool will make sure you capture it in the best way it can. You just need to initialize the recording process after which you launch the app or process to record. Everything on the screen will be recorded as the warning displayed on the record window says. That is why you need to activate DND mode as explained below. When making a screen recording, it is best to have no interruptions and disturbances as they make the screencasting process cluttered. These interruptions can be notification alerts, calls, and even messages. You can use the built-in screen recorder without all these by enabling DND mode on your iPhone/iPad. DND is an acronym that stands for ‘Do Not Disturb’. With it enabled, you will make clean screencasts as you prefer. It is not good practice to record screen content with other unwanted content interfering with the work at hand. Show some professionalism by eliminating that with DND mode if you don’t want to keep your device offline. Long pressing the Screen Record button while in the Control Center will give you access to a toggle where you will be able to enable or disable microphone recording. Once enabled, any external audio will be captured and mixed automatically with the recording video. It is a handy feature that is useful when you need to include narration, voiceover and any other audio that you need to be included with your video. Captured audio spices up a video making it more lively unlike when it is just silent giving a boring experience. This is a feature that is popular with screen recording apps and the built-in screen recorder on the iPhone/iPad does not miss out on it too. Basically, you get a time countdown before the recording actually starts to ensure that you are not caught off guard. With a countdown, you will avoid re-records and extra editing afterward. This tool gives a countdown starting from 3 which is a good duration to not wait for too long and not too short. 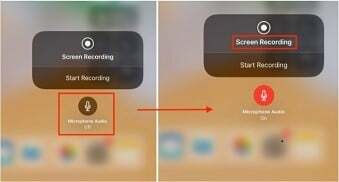 You can start recording with the built-in screen recorder for iPhone/iPad but maybe not know how to keep track of whether content on the display is being captured or not. No need to worry though as this tool shows a pulsating red icon that serves as a button too visible at the top of your device screen. In case you have no such light, just know that the recording process was not initialized as it should be. Once you are satisfied that all needed content has been captured, you will be able to stop the recording from the button at the top of your screen after which a toast message indicating that the file has been saved successfully will be displayed. The recorded file can then be retrieved from the gallery or camera roll for further actions which can entail editing and ultimately sharing to a destination of choice. Once you have recorded the video and saved it successfully, the next task that follows is sharing to the target audience. The file can be transferred to a Mac or PC for extra editing to spice up the recording further. The final file can then be uploaded to a cloud server, local network, social sites or even a personal computer notwithstanding whether it is a Mac or Windows PC. It is worth noting that sharing does not happen from the tool but from the gallery after saving. The built-in tool will just let you record and save the output file locally. The iPhone/iPad built-in screen recorder may lack in terms of extra control features and options but it will enable you to make a screen recording that meets shareable standards. The screen recording just got introduced with the most recent versions of iOS and the future may hold even greater stuff when it comes to iPhone/iPad screencasting options. We hope for even more features to be implemented to the built-in screen recorder, therefore, giving third-party apps real competition. You must be well-informed now on what to expect when you decide to give this tool a run. Give it a try today without speculating on what it offers.